Little Sue Lin (Vicky Tiu), is a scene stealer, with her big saucer eyes, hearty appetite and sweetly scheming way in the 1963 Elvis movie: It Happened at the Worlds Fair filmed on location at the Seattle Worlds Fair. It was the only film Vicky Tiu ever made. 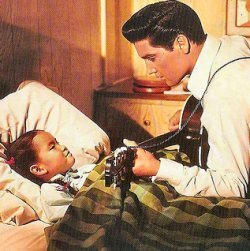 S he wasn’t the first choice – her sister, Ginny Tiu, who’d appeared with Elvis in the movie “Girls! Girls! Girls!” But Ginny Tiu had a more important invitation: to play piano for President Kennedy in the White House. It Happened at the Worlds Fair has a thin plot – the pace laborious, the tunes largely catchy and the scenery rather flat. But it was only the fourth known studio movie to be made in Seattle and it put us on the cinematic screen much the way the fair put us on the global stage. In his pre-star, pre-Goldie Hawn days, Kurt Russell, then 11, made an uncredited appearance in this MGM production. 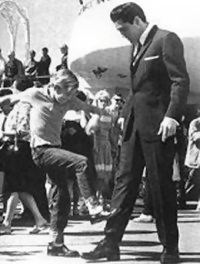 Russell, who coincidentally portrayed Presley on screen long after the King’s death, plays a kid wandering the fair. He’s approached by Presley, who asks the youngster to kick him in the shin for a quarter. Why? Because Presley is trying to woo a hot nurse with a frosty exterior and he needs a legitimate injury to go see her. Mike (Elvis Presley) admires Sue Lin’s (Vicky Tiu) ravenous appetite after he is called upon to watch over the youngster during a day at the fair. The San Francisco tot turned out to be a scene stealer. So, off they hitchhike to Seattle to scrounge up some work at the World’s Fair. In the meantime, nurse Diane fights off Mike’s practiced come-ons as he tries to change her mind with food, drink, a guitar and a little girl in pigtails. Little Sue Lin (Vicky Tiu), is a scene stealer, with her big saucer eyes, hearty appetite and sweetly scheming ways. She wasn’t the first choice. However her sister, Ginny Tiu, who’d appeared with Elvis in the movie “Girls! Girls! Girls!” had another invitation she couldn’t refuse: to play piano for President Kennedy in the White House. So, little sister Vicky Tiu was offered the role. It was the only film Tiu ever made. Today Vicky (Tiu) Cayetano is first lady of Hawaii. She remembers that Presley even had a way with girls as young as she. One day she was nervous and struggling with one scene that stretched into about 30 takes, and could see the director getting frustrated. She started stuttering. “Finally, Elvis said, ‘That’s it, it’s a wrap, the little lady and I are going to have something to eat,'” she recalled.. After Elvis took her to dinner, the next day she nailed the scene immediately. “At that age, I didn’t understand the magnitude of his fame and popularity. But he was a gentleman,” said Cayetano, now in her late 40s. She also remembers meeting Kurt Russell on the set. “I recall Kurt Russell telling me how much he enjoyed it. He said, ‘When I get out of school, this is what I want to do.’ And I thought, well, this is not what I want to do,” said Cayetano, who went on to Stanford University and is now the chief executive officer of a commercial laundry service in Honolulu. Cayetano has a few remnants from her moviemaking days: a copy of the script and a big red teddy bear. In the movie, she shows Presley up at a carnival game, knocking down some bottles with a softball after he has missed. She got the teddy bear prize. Naturally, Presley got the girl.